The Jathika Namal Uyana is located 7 kms away from Madatugama junction of Colombo- Anuradhapura highway in Sri Lanka. 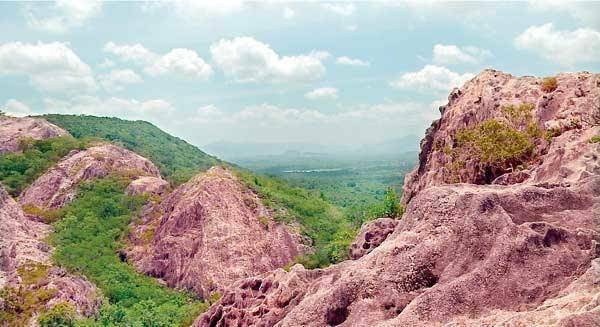 It is the largest ironwood forest and the pink quartz mountain in Asia. The place is actually a rare forest which has numerous iron wood trees since 8th century AD. Initially it was a sanctuary for the monks during king Devanampiyatissa’s rule over the country in the 8th century. Ironwood forests a different kind of forest in Sri Lanka as the ironwood tress dominate the vegetation of the 260 acres of the forest. It is recently declared as a National Heritage Site under the Department of Wildlife Conservation (DWLC). According to a research it has been found that the age of the pink quartz is more than 550 million years. The overall view of the top portion of the mountain gives a view which appears like misty clouded and the pink cololur mixed with the white clear mist. This is indeed a beautiful place to visit and enjoy nature at its best.